Home >> Blog >> Fun Facts About Our Oceans to Share with Kids -World Oceans Day is June 8th! Fun Facts About Our Oceans to Share with Kids -World Oceans Day is June 8th! 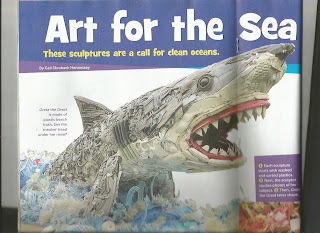 Check out my latest article, "Art for the Sea", in the current issue of Highlights for Children. All of Angela Pozzi's amazing art sculptures were created from plastics that washed ashore along the cost of Oregon. This article would be a great introduction to a discussion on our oceans. World Oceans Day is June 8th. Exploring the Ocean Blue: Fun Facts about the oceans of the Earth. 1. Coral has been used to repair bones in humans! 2. Blue Whales can weigh as much as 30 elephants and are as long as three Greyhound buses! Its heart is about the size of a Volkswagen! 3. Basket Starfish has the most arms of any sea life... 80,000! 4. The highest wave ever recorded hit near Lituya Glacier in Alaska , in 1958. It was 1740 ft. high! 5. Wondering how many marine species exist? According to World Register of Marine Species (WoRMS), at least 212,906! 6. Scientists say the jellyfish is older than the dinosaurs, dating back at least 650 million years ago! 7. Did you know that a dolphin sleeps with one eye open and with only half its brain. 8. The highest tides occur in the Bay of Fundy in Nova Scotia,Canada, reaching 53 ft. high! 9. The Ring of Fire located in the Pacific Ocean is the largest zone of active volcanoes on the sea floor. 75% of the world's volcanoes are here! 10. There are 25,000 islands in the Pacific Ocean! 11. On April 17, 2013, a bottle washed up on the shores of a beach in the country of Croatia. It had been thrown into the sea in Nova Scotia, Canada....4000 miles away! Scientists say it probably traveled 5x that in its 28 years at sea! 12. Great Britain (2013) is building the world's largest wave farm. It will power about 30,000 homes. 13. A fish thought to be extinct for 60 million years was caught alive by fisherman off the southern coast of Africa, in 1938. Called a coelacanth, the fish has been around for 300 million years. 14. If you measure the tallest mountain from the sea floor up, Mt. Everest isn't the record holder.! The highest mountain would be Mauna Kea, in Hawaii. It is 33,474 ft from the ocean floor but only 13, 680 ft. above sea level. 15. Need light? An electric eels can make enough electricity to run about 10 light bulbs! 16. The longest mountain range on Earth is found in the Atlantic Ocean,from Antarctica to Iceland! 17. There is so much salt in the ocean that if all the salt was dried and collect, it would cover all the continents with 5 ft. of salt! 18. There is enough gold in the world's oceans for each person on the planet to have almost nine pounds of gold! 19. You can see the world's largest reef, the Great Barrier Reef,in Australia, (1616 miles long) from outer space! 20. The earth has an estimated 315,000 miles of coastlines...that's enough miles to go 12 times around the Equator! 1. Illustrate one of the factoids. Write a sentence explaining your drawing. 2. What are three reasons the oceans of the world are important to us? 3. Scientists say there are FIVE oceans covering our planet. The Southern Ocean has been added. It is also known as the Antarctic Ocean. Name ONE fact about each of the other 4 oceans. 4. Have you ever visited an ocean?____________ Pretend you are at the ocean. Write a paragraph describing what you see, hear, smell and feel. 5. Why do you think there is a World Oceans Day? The ocean is a place which brings tranquility and so many great memories of growing up and going to the Jersey Shore for family vacations. I remember learning to surf(wasn't very good at it) and my sister and I could stay in the ocean for hours! My husband and I still enjoy getting a chance to visit the Jersey Shore and family members both at Long Beach Island and Cape May. 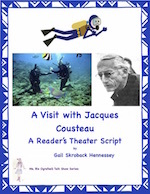 I also have a Reader's Theater Script on Jacques Cousteau you may find of interest (part of my Ms. Bie Ografee Talk Show series of plays).